The evening began with the inevitable post-Essen chit-chat and games-mule deliveries (though most of it hadn’t been unpacked so that’s something to look forward to next week too). Burgundy was very pleased with his substantial pile of Concordia expansion maps though (including the new Venus expansion and older Britania/Germania, Gallia/Corsica packs), and Pine was thrilled to hear there was a copy of Echidna Shuffle on its way for him too. With food delayed, and a lot of people already arrived, we decided to get going with the “Feature Game”. Prior to Essen, we had planned to play Key Flow, however, that was still packed and there hadn’t been time to learn the rules, so instead the “Feature Game” chosen was Peppers of the Caribbean. This is a cute little set collecting card game with a very loose pirate theme. Each card features a number, a colour and a type of food. The idea is that there is a face up market and on their turn, players can either take cards from the market, or play cards. To take cards from the market the active player must first discard a card and can then take all the cards of that colour or all the cards of that food type into their hand (discarding down to seven if necessary). Alternatively, they can play a set of three or four cards where all the cards have different colours and different food types. Of these, two cards are discarded and the remaining cards are kept for scoring. At the end of the game, players sum up the face value of the cards in their pile of kept cards, and the highest score is the winner. There are one or two fine details, for example, as well as “chilli cards” there are also rum cards which feature two colours and no food. These have a high value (six, compared with one to four for the chilli cards) and can help people make sets more quickly. However, as they have two colours, this means there can only be one rum card in a set and the maximum set size is then three, so only one card can be kept reducing the scoring opportunity. There are also bonus points cards which are drawn largely at random from a pile—some of these are end-game bonuses and others reward the first player to reach a goal (e.g. be the first player to have all four different food types in front of them). Just as the game was coming to an end, Black and Purple arrived in need of some R&R after what had been a trying day. They had also brought some of their Essen Loot (including a copy of Las Vegas for Red), and the Essen discussion began again. Black and Purple had been at the fair for the full four days and felt that a minimum of two was needed to see everything, but three days was a more realistic time. Blue and Pink had been there for just two days as they can’t cope with the crowds for more than that. Even they are considering a Thursday-Friday-Sunday strategy for next year though as there are now six halls (some very large indeed), and they felt they had missed a lot of things that they had wanted to see this year. That said, a lot of games sold out including the expansions for Altiplano and Great Western Trail (Altiplano: The Traveler and Great Western Trail: Rails to the North), Mini Rails (again! ), Hanamikoji, Food Chain Magnate, Roll to the Top, Majolica, Spirit Island, Echidna Shuffle, Ceylon and headline releases Teotihuacan: City of Gods, Architects of the West Kingdom, Newton, The River and Everdell. Some of these went ridiculously fast, for example Everdell apparently sold out in six minutes on Saturday despite its not insubstantial price tag of €70. Purple and Black were particularly pleased with Solenia, which they had played at the fair and then managed to grab one of the last few copies available. A beautiful game with a totally over-produced large yellow airship and cards with a hole in the middle, it wasn’t long before it became clear that it was going to be one of the games to make it to the table. The pretext is that several millennia ago, the tiny planet Solenia lost its day-and-night cycle: its northern hemisphere was forever plunged into darkness, and its southern hemisphere was eternally bathed in bright sunlight. Players travel the world delivering the rarest gems and stones to the “Day People” and take wood and wheat to the “Night People” who need them to survive. In return players receive gold stars and the player with the most of these at the end of the game is the winner. In each round, players take it in turns to play one card from their hand onto an empty space on the five-by-five game board. Cards can be played either on a “Floating Island” or a “Floating City”. Cards played on Floating Islands will give as many resources as the value of the card played of the type corresponding to the City. Cards played on Floating Islands enable players to fulfil a delivery tile by delivering the resources depicted on it. Cards must be played adjacent to the airship in the centre of the playing area or adjacent to one of the players previously played cards. When someone plays a zero card, the airship advances one space along the modular board. At the end of that turn, the back piece of the game board is removed and players receive resources based on the cards they have on this strip of the playing area. This strip is then turned over (turning night to day / dawn to dusk or vice versa), and it is placed on the front edge of the game board, and thus the airship moves across the planet. This constantly changing board rolling from day to night and back to day again gives the game a unique feel. Although resources were far from scarce (unlike other resource management games), it still has quite a bit of resource management thanks to a strict resource limit on a players personal board. Thus, the real problem came in deciding which were the most important resources to keep, a little bit of area control/route planning, and a few paths to victory points. The constantly changing nature of the game doesn’t lend itself to a developing narrative though having played it before, Black and Purple had an edge over Green. This wasn’t helped when Green misunderstood one of the cards and tried to do something clever to multiply his points. The first attempt failed, but on the second try he thought he had achieved more points and then the misunderstanding came to light—the bonus points only applied to the card itself not to all types of terrain he had cards on. It would not have changed the placings though. It was very tight between Black and Purple until Black managed to gather together three pairs of day and night bonus chits, which hadn’t been looking likely until the last couple of turns. With that, he just sneaked his nose in front, winning by three points. Overall Solenia is a clever game that takes a run through to get a feel for how it works and then you then just want to play again—it certainly won’t be long before it gets another outing. 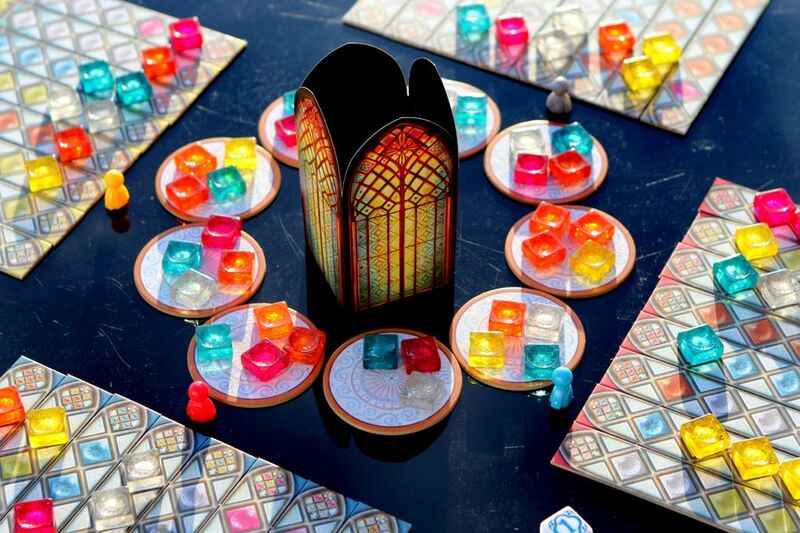 Meanwhile the other four were giving Azul: Stained Glass of Sintra a try. 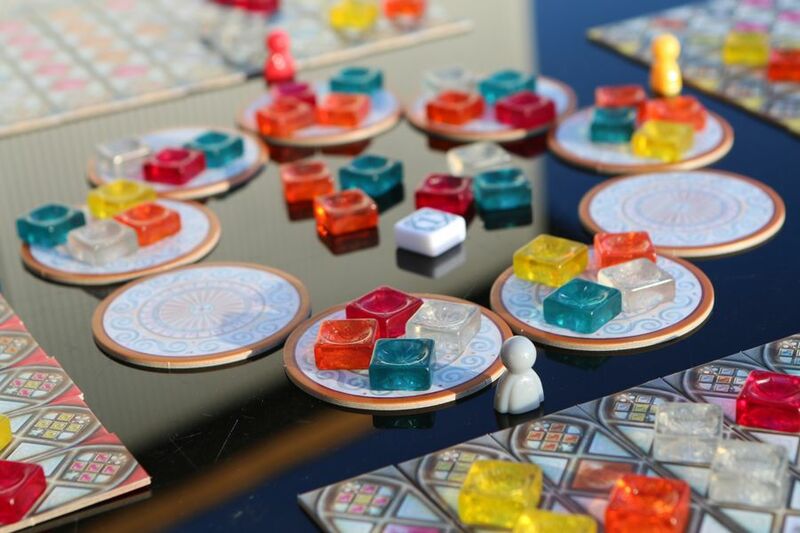 This was another Essen release, and one that had generated a lot of “buzz” in advance as it was produced by the same team that originally published this year’s double award winner, Azul. Blue, Purple, Black and Pink had all tried it while in Germany and found the scoring sufficiently different and interesting that they had collectively come back with two copies. Initially the conversation centred around the clear plastic tiles that, largely dependent on age, reminded some people of Spangles (“The sweet way to go gay”) and others of “Tunes” (“Help you breath more easily” and thus “Book a second-class ticket to Nott-ing-ham”) . Once the subject had moved away from 1980s confectionery, attention focussed on the new game and its similarity and contrast with the original Azul. 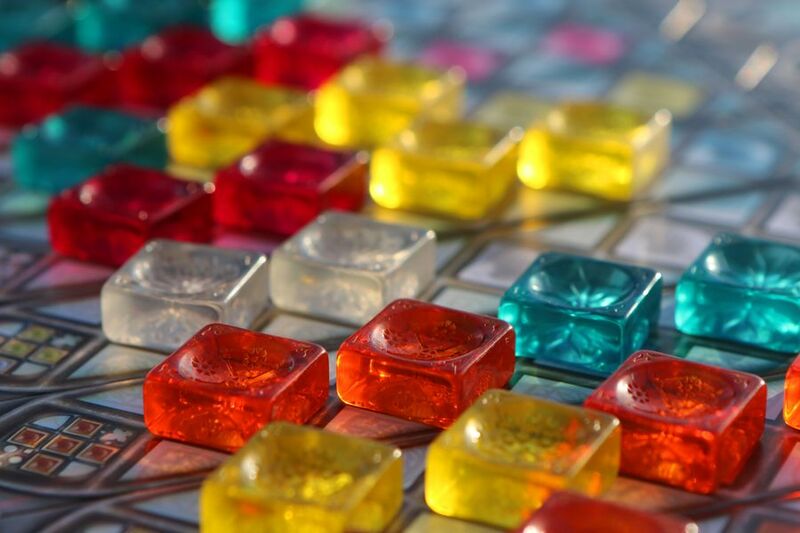 As in the original, players take all the tiles of one colour from a “factory” and put the rest in the middle, or they take all the tiles of one colour from the middle. Tile placement and scoring is rather different however. All the tiles taken in a turn are placed in a single column of the player’s personal player board. This board is modular with the double-sided strips laid out at random so everyone has a different starting setup. Above the board each player has a figure, their Glazier, who marks one strip. Tiles must be placed in the strip immediately below the Glazier, or in a strip to the right of the Glazier. The Glazier gives players another option on their turn too, as players can choose to reset his position to the left most strip (instead of taking tiles). Scoring is very different, with players getting points when strips are completed. The number of points scored is the sum of the score depicted below the strip, plus the score for any strips to the right that have already been completed. There is also a colour bonus—each round has a colour drawn at random at the start of the game, and any tiles that match the colour for the round score extra. Once a strip has been completed, it is flipped over; after it has been filled a second time it is removed, reducing the players placement options. This provides a subtle catch-up mechanism that takes effect towards the end of the game. Any left over tiles that cannot be placed yield a penalty (as in the original Azul game), but this is also different. In addition to the positive score track, there is also a negative score track where the steps start off small and then get larger; penalties are accrued for left-over tiles and also for being first to take a tile from the middle (and with it the Start Player token). There are also end-game bonus points with two variants available, one colour dependent and the other rewarding completing adjacent strips. All in all, the game is definitely a step up in complexity, making it more of a challenge for those who have played Azul extensively. As most of the group fall into that category, we had high hopes that Stained Glass of Sintra would be a good fit. It certainly offers a new challenge, though it was clear that the fact Blue had played it before gave her a significant advantage. For example, the timing of repositioning the Glazier is very critical. It doesn’t necessarily prevent a player getting a load of tiles they don’t want (as everyone can reposition their Glazier and the problem will come back round), but players don’t want to be stuck with their Glazier far to the right at the start of a new round as that limits their choice when the options are at their best. Similarly, player don’t want to reposition their Glazier too frequently as this reduces the number of tiles they take and therefore affects their score. Behind Blue it was very tight for second place with just five points covering Pine, Burgundy and Ivory. It was Pine who got his nose in front though, by keeping his negative score down and concentrating on his end-game bonuses. Unfortunately, the game is not as nicely produced as the original: the broken glass tower is made of very thin card (more like thick paper) as is the score board. The “glass” pieces are also somehow not as nice as the resin tiles in the original and the colours are less distinct as well. These negatives are a real shame as they take the edge off what would otherwise be a excellent reimplementation of the superb original game. Green and went home for an early night leaving five others plus Pine who wanted to play something “in about forty-five minutes”. Deciding what to play took so long that there nearly wasn’t time to play anything at all, but after three new games, everyone was in the mood for something “comfy”, and eventually Bohnanza appeared. Pink’s new “Fan Edition” was still packed, as was the Jokerbohnen mini-expansion that Blue had acquired. She had not brought her Spanish copy either, so it was the “boring” Rio Grande Games edition. Familiarity sometimes has its place though, and this was one of those times. Nobody needed a reminder of the rules (plant the first bean in hand; optionally plant the second; turn over two cards and plant or trade them; trade from hand, and draw cards placed at the back of the hand), but the setup varies for different numbers. It wasn’t long before we were underway, however, and Purple quickly began to amass a crazy number of Red Beans. It felt like nobody else could really compete although Black came very close finishing with thirteen coins, one behind Purple. Learning Outcome: New is very exciting, but that comfy pair of old slippers still has its place. This entry was posted in Games Night and tagged Altiplano, Altiplano: The Traveler, Architects of the West Kingdom, Azul: Stained Glass of Sintra, Bohnanza, Bohnanza: Die Jokerbohnen, Ceylon, Concordia, Concordia: Britannia / Germania, Concordia: Gallia / Corsica, Concordia: Venus, Echidna Shuffle, Everdell, Food Chain Magnate, Great Western Trail, Great Western Trail: Rails to the North, Hanamikoji, Key Flow, Majolica, Mini Rails, Newton, Peppers of the Caribbean, Roll to the Top, Solenia, Spirit Island, Teotihuacan: City of Gods, The River on November 13, 2018 by nannyGOAT.